And then you’ll sit back in your seat, take a long drink of that Hefeweizen, and wonder why we in the West can’t get it together just a little bit and get a piece of this progressiveness of our own, at which point you’ll remember that building a high speed rail network as good as Germany’s would take billions of dollars and a total switch of mindset r.e. our automobile-centric culture, and it’s simply way too late to do anything about Western sprawl lest you’re using a massive fleet of bulldozers to do it with. Those rooftop solar panels, though, may be a different story. They are ubiquitous in Germany not because people there are naturally more green-minded than us, but because of cold, hard Euros, a.k.a., a pro-renewables program called the feed-in-tariff. The feed-in-tariff, or FIT, is a critical component of Germany’s Energiewende -- or energy turning point -- the movement and set of policies that has moved the nation from almost total fossil fuel dependency to relying more and more on renewables for its electricity. FIT guarantees that anyone generating renewable electricity on their own can sell that power back into the grid at a premium rate. That means those farmhouse solar panels -- even in a place like Germany, where the sun is a pale shadow of Arizona’s -- can not only offset the power bill, but also generate cash. In most of the U.S. homeowners can put rooftop solar back into the grid, allowing their electric meters to run backward when their panels generate more power than they're using. But the return is typically not enough to make it worth it, financially, to invest in a solar array. That, however, may be changing. Last month, Los Angeles adopted a feed-in-tariff program, the most ambitious in the nation, that could nudge the city’s rooftops to get that photovoltaic glint. It’s just L.A., and the plan isn’t perfect, but L.A. has a whole heck of a lot of roofs and parking lots to cover with PV panels. If other cities and states follow L.A.’s lead, could this be the beginning of the West’s own Energiewende? Maybe. Germany’s transition has been inspired, in part, by conditions that are much different than ours. They’re not sitting on top of billions of tons of cheap coal and trillions of cubic feet of natural gas. They get most of their natural gas from Russia, which charges a premium, while we have a gas glut. They have lignite, or brown coal, but it’s far dirtier and lower in energy content than Wyoming coal. They have a very powerful anti-nuke movement: Millions took to the streets after the Fukushima disaster and prodded Chancellor Angela Merkel to reverse her stance on a nuclear phaseout -- now, nuke plants are already shutting down (with some unintended consequences, such as an increase in lignite consumption and in coal imports from the U.S., but also more urgency to get more renewables online). Americans use almost twice as much electricity, per-capita, as Germans. Our energy-guzzling ways make it difficult for a single-family home to generate enough solar power on its rooftop to offset its own energy use, one reason such homes aren't eligible for the L.A. FIT program, which currently only includes "multi-family dwellings, warehouses, school facilities and parking lots," writes the Los Angeles Times. It’s difficult to fathom how the U.S., as a whole, can make a transition that looks anything like Germany’s. 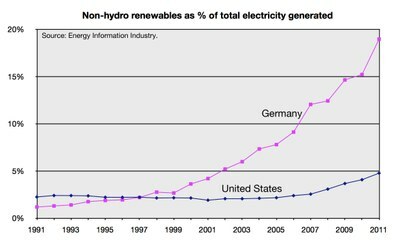 Back in 1991, about one percent of electricity generated in Germany was from non-hydroelectric renewables. Today it’s around 20 percent. Our country continues to flounder near 5 percent. But on a state-by-state basis, there’s hope. California’s running neck-and-neck with Germany on renewables, and state law mandates that it will get 33 percent of its power from renewables by 2020, right on par with Germany. It makes sense: Germany’s plan actually originated in California decades ago. Now, maybe, spurred on in part by L.A.'s feed-in-tariff, it can come back home.